The Cascades of Fire is a new signature event for the Winter Festival of Lights. 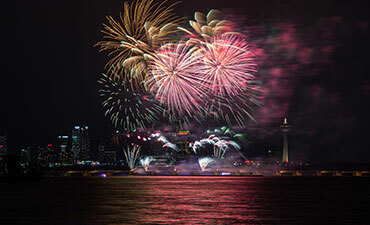 Six teams will compete against one another for the best fireworks displays over Niagara Falls. These teams tour all over the world and arrive in Niagara Falls for the November competition. Ten minute extended fireworks display from the lower Niagara Gorge. All firework displays take place at 9 pm weather permitting. The competition displays taking place on November 16 and 17 will have music broadcast simultaneously on Star 102.5. Please note Team Vietnam and Italy have been cancelled.